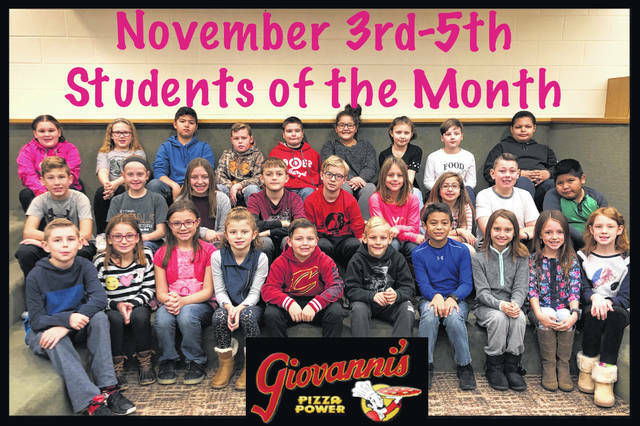 Miami Trace Elementary School announced its students of the month for November recently. The Pre-K through second grade students of the month were (L to R): front row: Hailey Queen, Claire Noble, Cohen Butts, Ava Hoppes, Carson Knisley, Rylyn Moseley, Violet Sims, Draco Holder and Ariyah Brown. Middle row: Sarafena Crabtree, Zakiah Weaver, Kendal Tyree, Cooper Maxie, Cooper Armstrong, Jonathan Cruz Paso, Asia Baker, Carter Gray and Cayden Woodward. Back Row: Jordyn Stevens, Maria Jackson, Alexis Thompson, Ryan Hatert, Haidyn Myers, Hagen Hastings, Eli Barnard, Easton Woods and Bodey Brackens. The third through fifth grade students of the month were (L to R): front row: Elijah Gullett, Peyton Gautier, Delani Downs, Sydney Forsha, Xavier Lowe, Hayden Cornell, Bartolo Quetchum, Zoey Penrod, Baylee Woodrow and Jillian Jenkins. Middle row: Anthony Huffer, Natalie Pitstick, Rylee Ferguson, Gage Henry, Sam Stoughton, Hayden Ratliff, Savannah Fausnaugh, Jackson Black and Irvin Juiarez-Ramirez. Back row: Rilyn Jones, Grace Green, Derrick Greenwood, Preston Lucas, Nephi Lankford, Arianna Jones, Taylor Sexton, Maddox Price and Noah Thirty-Acre. Not pictured: Kaylee Craig, Henry Meyer, Nate Rodgers, Rhylee Payton and Xander Cummings. 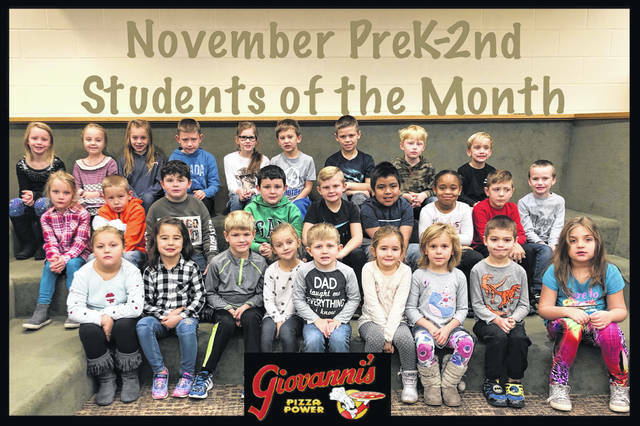 https://www.recordherald.com/wp-content/uploads/sites/27/2018/12/web1_k-2.jpgMiami Trace Elementary School announced its students of the month for November recently. The Pre-K through second grade students of the month were (L to R): front row: Hailey Queen, Claire Noble, Cohen Butts, Ava Hoppes, Carson Knisley, Rylyn Moseley, Violet Sims, Draco Holder and Ariyah Brown. Middle row: Sarafena Crabtree, Zakiah Weaver, Kendal Tyree, Cooper Maxie, Cooper Armstrong, Jonathan Cruz Paso, Asia Baker, Carter Gray and Cayden Woodward. Back Row: Jordyn Stevens, Maria Jackson, Alexis Thompson, Ryan Hatert, Haidyn Myers, Hagen Hastings, Eli Barnard, Easton Woods and Bodey Brackens. https://www.recordherald.com/wp-content/uploads/sites/27/2018/12/web1_3-5.jpgThe third through fifth grade students of the month were (L to R): front row: Elijah Gullett, Peyton Gautier, Delani Downs, Sydney Forsha, Xavier Lowe, Hayden Cornell, Bartolo Quetchum, Zoey Penrod, Baylee Woodrow and Jillian Jenkins. Middle row: Anthony Huffer, Natalie Pitstick, Rylee Ferguson, Gage Henry, Sam Stoughton, Hayden Ratliff, Savannah Fausnaugh, Jackson Black and Irvin Juiarez-Ramirez. Back row: Rilyn Jones, Grace Green, Derrick Greenwood, Preston Lucas, Nephi Lankford, Arianna Jones, Taylor Sexton, Maddox Price and Noah Thirty-Acre. Not pictured: Kaylee Craig, Henry Meyer, Nate Rodgers, Rhylee Payton and Xander Cummings.